I’ve been trying to get back in shape, and so we’ve been logging some time in the jogging stroller. It’s hard work running with a double stroller. And sometimes it’s not an option for me to talk to the kids and breathe at the same time! 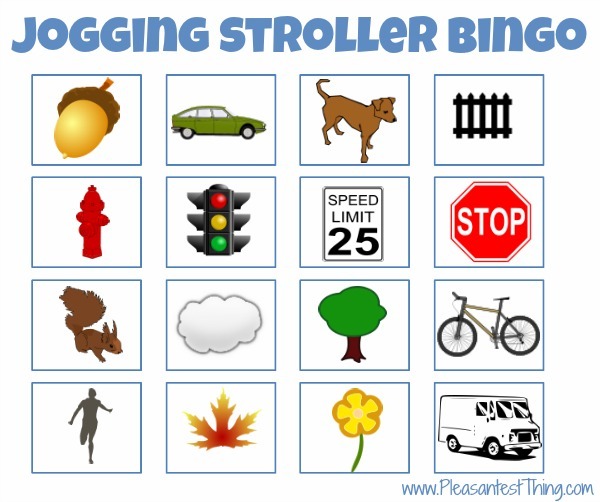 For times when I’m too out of breath, I pull out my jogging stroller bingo sheets. I have a couple of versions with objects we are likely to see on our usual routes, and my sons (4 1/2 and 1) look for the items on the sheets. When they find something, they mark it with a little star sticker or a crayon (whichever I happen to have grabbed on our way out). We talk about what we see as my son marks off the box. Ok, my 4 1/2 year old talks, my baby points out “gogs” (dogs), and I try to huff out a few words. The way we play, it’s a collaborative game. If we’ve been doing a few runs in a row, we make a rule up that we can’t use the same object we used on the previous run. Colors: print out several squares of colors, and the child puts a sticker on a color when they find something of the same color. So if there are four red boxes, and your child points out a red flower and then places a sticker on one of the red boxes. Shapes: same thing, just use several different shapes. Words: Once my son starts reading, I am going to make a version with simple words for him to add a little challenge. I would love to hear any other ideas you have for making runs for fun for the little ones. Please leave a comment with any ideas.